This is a guest post by Todd. A writer, blogger, and conflict resolution specialist; he blogs about his travels and adventures at Todd’s Wanderings. He currently lives in Kosovo, and lived in Japan near Kyoto for over five years. He’s working on his first book about walking the 900 mile Japanese Shikoku Pilgrimage, twice. Kyoto is one of those magical cities that every person should visit. However, like all proper Japanese maidens its secrets take a long time to discover. Its beauty lies in the glimpse of a geisha as she flirts around a corner, the hidden alleyway sheltering a 400 year old noodle house, or the tiny garden hidden from view but tended to as honestly as a member of the family. All of this is hidden amongst the disaster of post WWII urban planning and the waves of ugly concrete and electrical lines that spread out from city’s center. It takes commitment to experience the elegant Kyoto, time the typical visitor doesn’t have. For those looking for rare glimpses that have delighted travelers for centuries here is list of my favorite places that can be experienced in any two day trip. The bastion of cultural protection, Higashiyama (literally “Eastern Mountains”) has maintained the feeling of old Kyoto with its massive temples, narrow alleyways, quite gardens and tiled wooden houses. Start your walk towards the Buddhist temple Kyomizu-dera, where you’ll find spectacular views of Kyoto from the main veranda supported by hundreds of pillars. DON’T approach the temple from the main road, instead find the small road just south and follow it through the ancient hillside cemetery, perhaps the most scenic and ignored area of Kyoto! Continue your walk north and take a tea break in the traditionally restored neighborhood of Sannen-Zaka. Move on hitting any shrine or temple you see (there are tons) and you’ll end up in Gion, the famous entertainment and geisha district. Remember this area as you’ll want to come back in the early evening for your best chance of catching a glimpse of a geisha or maiko (apprentice geisha). Stay for dinner and drinks on Pontocho-dori, a small road where hundreds of little restaurants compete for your taste buds. The northern section of Higashiyama starts from Kaege Station on Tozai subway line. Hit the massive, ancient and delightful Nanzen-ji. Don’t forget to explore all of the sub-temples. Continue north and find your own favorites, with 2,000 temples and shrines in Kyoto I’m sure you will find something. Pass through the Tetsugaku-no-michi (path of philosophy), a pedestrian path along a canal lined with cherry blossom trees. 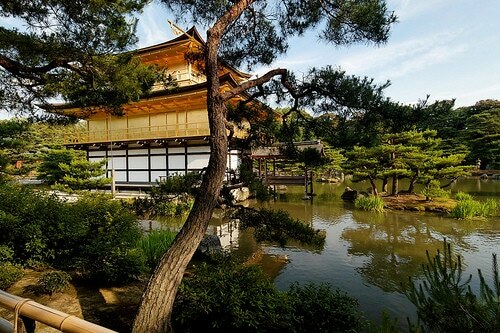 Complete your walk at Ginkaku-ji, temple of the silver pavilion. There is no silver pavilion but it boast one the most impressive tea gardens in all of Kyoto and is often overlooked by most visitors. Located near each other in Northwest Kyoto these two temples can easily be combined in a morning session, which is probably better as they can become packed with visitors quickly. Kinkaku-ji with its famed “Golden Pavilion” is an impressive ostentatious temple originally built as the retirement villa of Shogun Ashikaga Yoshimitsu. The Zen temple Ryoan-ji with its austere rock garden stands in stark contrast to affluence in the neighborhood. Arrive early before the crowds and the annoying loudspeaker. Located in the western mountains of Kyoto this is a busy tourist town, but the delight is in the temples and quite areas up the hill. 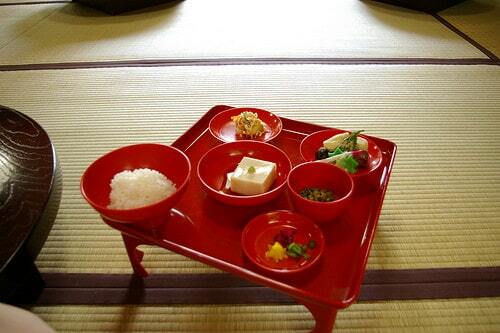 Experience shojin-ryori, the vegetarian cuisine developed by Zen monks, at Tenryu-ji. Explore the temple before exiting by the north gate to wander through the amazingly green bamboo forest. This is the most beautiful part of the area so walk slowly and enjoy it. 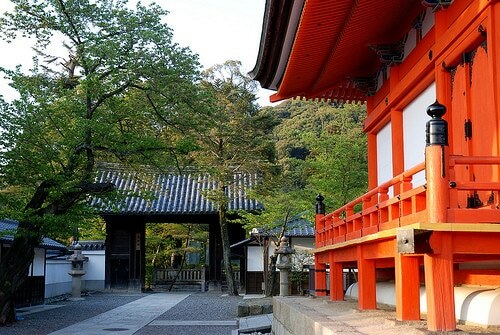 One of the most mystical places in Kyoto, this Shinto shrine is dedicated to the god for rice and business, Inari. 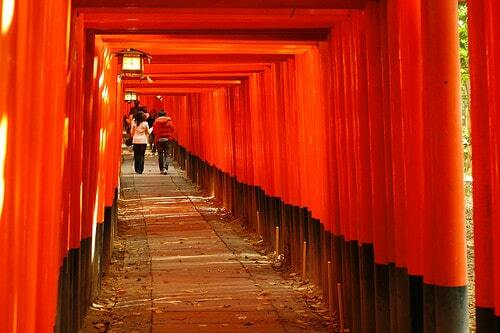 Located on a hillside, over 10,000 red tori gates line the paths transporting any visitor into another world. Come during the early evening just before sunset for a heightened sense of the other side as you get lost within the winding paths and statues of sly foxes, Inari’s messengers. The shrine is just a 5 minute train ride from Kyoto station on the JR Nara line. What guide would be complete without advice on drinking and eating with the locals? There is not a huge club scene in Kyoto (head to Osaka instead) but small bars are everywhere. Visit Kiyamachi between Nijo and Sanjo for an area teeming with small bars and restaurants. No suggestions here other than find a random place and enjoy. Oh, and good luck finding your way out of the side streets afterward! If you want to drink with the younger crowd, buy yourself an oversized beer (or three) at a convenience store and head to the Sanjo bridge nearby and grab a seat on the banks of the Kamogawa river. There is sure to be some group jamming to an acoustic guitar. Many thanks to Todd for this insightful post about Kyoto, Japan. You can read more from Todd on his blog, Todd’s Wanderings and follow him on Twitter (@toddwassel). The pictures were breathtaking- and the post was equally amazing!! Definitely makes me want to read your book when you are done. Very insightful post and one to bookmark for my return to Japan. We drank with the locals in Tokyo, an experience I’ll always remember! Fab post. I absolutely loved Kyoto. Thanks for sharing this and bringing back lots of wonderful memories. 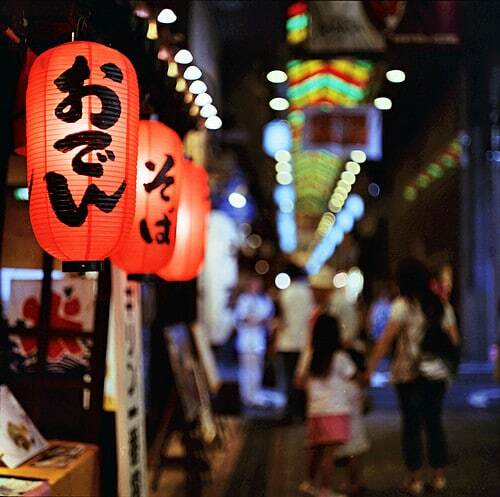 Wow, I had never thought of going to Japan but these photos are so amazing. I wish I could afford to do it on this trip but it will definitely be on my wish list. I don’t think you could go wrong with that plan! Thanks for all of the kind words everyone. I lived near Kyoto for about 5 years and never got tired of it. I was still discovering unique places there until the day I left. If you ever want any other suggestions on your future trips to Japan just let me know. It doesn’t have to be as expensive as people fear. I too echo everyone’s comments here, great guest post. Hi, Todd. We are planning a trip to Osaka but we have no idea of what and where to visit. Since we’re not following a tour group. Would you recommend places to visit during winter time? A dream location. My sole visit to Japan never took me out of Tokyo – somthing that seems like a big mistake with beathy such as this not so far away. Fantastic post. I’m heading to Japan for a two or three weeks this summer. Todd, this is fantastic and so timely, because we are leaving for Japan in two weeks. When I saw your tweet about it a few days ago I knew this would come in handy for you. Glad the timing was right and Todd submitted such an informative post. This post brought up my beautiful memory in Kyoto. Kyoto is among the first places my husband (boyfriend that time) and I made a trip together. We went there from Tokyo using bunch of local trains and we rented a cheap room (came with cockroaches, we noticed later) at an expat’s house. We had a great time there. Kiyomizu dera was impressive, probably my favourite thing there. But that’s difficult to tell because others are very impressive too. Unfortunately we missed the Fushimi Inari Taisha, so I really need to go there next time we visited around Kyoto. Noticed later? Hopefully much later! “Later” as in we had already paid for the place. Not too much later, so we saw them walking around the room 🙁 It was so cheap though..
That’s a good detailed guide! What a charming area to experience old Japan and lovely photos – I’m sure there were some modern bits just out of range of your camera but it all looks very picturesque. Wonderful post. I visited Kyoto last fall but for only a day. The Golden Pavilion is beautiful, although crowded. You’ve given me ideas for the next time I’m there, which I hope will be soon. BEAUTIFUL pictures!!!Amazing! Now I have another place on my dream destination list! Great post. From what I saw of Kyoto, I could tell it’s amazing and I think Todd really explained it so well. I loved Japan so much more than I had expected to, and this post feeds my desire to go back and explore it more. A couple days in Kyoto are definitely on my list! Funny thing, but I’ve never had the least desire to see Japan. However, after seeing these photos and reading Todd’s post, I think it has to go on my travel wish list. It’s one of those places I think once you set foot in will take you away. I’ve pushed up much higher up on my list of places to visit as well. I will travel to Japan in this coming may. Will visit Tokyo and might going to Kyoto for 2 days. Any suggestion for 2days itinerary in Kyoto with transportation method? You mean in terms of best way to get around? Finally there are also trains throughout the city to get to more well known metropolitan areas (as well as Ayashiyama area). So final answer: feet, bus, trains. No need for Taxis, they are expensive. Great post! We’ll be starting our trip in Japan in September (just booked our one ways tickets to Osaka the other day) so this guide will be incredibly helpful for our time in Kyoto! Thanks!